I LOVE to paint with watercolors and I have since I was very small. I remember digging through the palettes in Elementary school to try and find one where some idiot didn’t muddy up all of the colors. It was a very, very big deal to me to the point that I was allowed to keep my own set in my desk. Remember those desks where they lifted up and all of your stuff was stored inside? Those were awesome. Man, I miss those things! 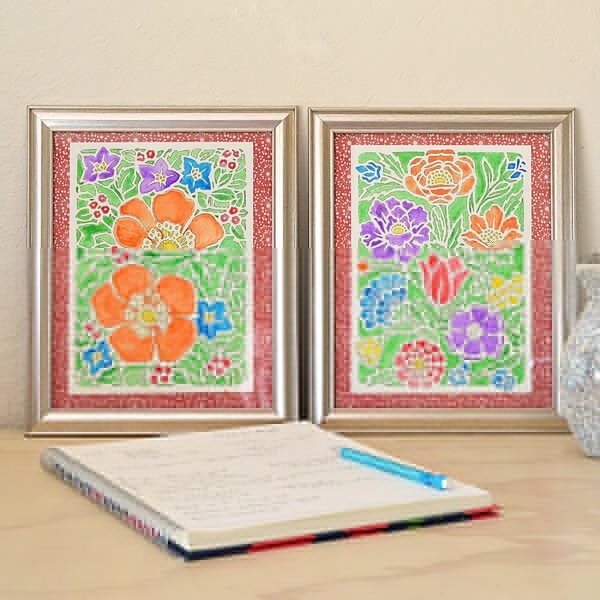 But I’ve gotten off track as I’m so often good at doing… The other day I decided that I wanted some floral watercolors for my bedroom makeover. You know, something kind of boho for the comfortable and colorful vibe I’m going for. But what I haven’t had a lot of lately is time. So I also needed something fast. 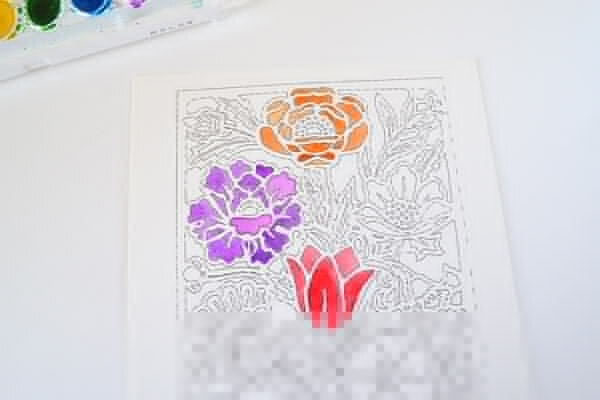 So I opened up my Silhouette Studio and made my own little paint by numbers and now I’m sharing the how to in this sketch pen tutorial! All you need are some dingbats that you love. What are dingbats? They’re fonts that don’t look like letters but like pictures. Basically like emojis but waaay older! When I was a kid I used to create my own little coded messages with dingbats and it was so much fun. I felt like a covert little spy. And if you still don’t know what I’m talking about, this is one of the dingbats I used for my paintings. This is the lowercase letter L – nifty, eh? There are also some pretty fonts with Geisha, Sea life and Zodiac images. Or you can just sift through the dingbats to find fonts with images you love! Now if you don’t have a Silhouette you can still do this. Just print your dingbat onto watercolor paper. But know you’ll have these big, heavy black lines if you do. If you’ve got good eyes, though, you can print in a light gray or beige so it’s thereto guide you, but not quite so obvious! Watercolor paper – I got mine for around $3 at Target – nice! Watercolors – I used Crayola brand for their BRIGHT colors! 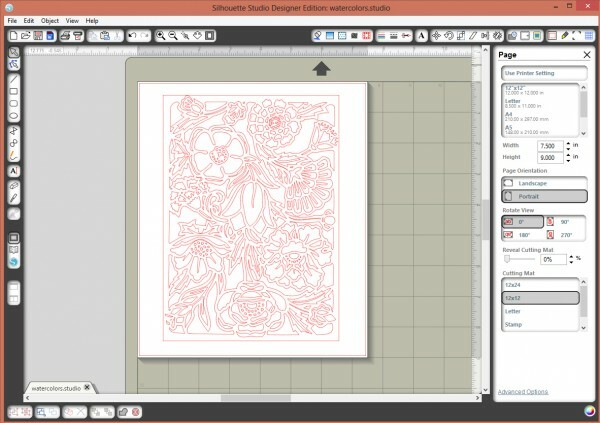 Bust out your Silhouette Studio software and change your work space to be the same size as your watercolor paper. Find the dingbat that pleases you, center it and get ready to “cut” it. Be sure to change from your blade to your sketch pen and get after it. I chose to draw in black because it’s easier to see and my eyes are getting old :) Plus I knew with the busy scrapbooking paper I would be using as a mat, they would hardly be obvious anymore. And here are my sketches. Now, my first attempt I left that line around the outer edge but after I painted the first one I hated it. So I ungrouped the dingbat then released the compound paths and just got rid of that outer edge completely. And now for the fun part! Paint your picture just like a color by numbers! Now this isn’t a get wild and crazy and wet your paper down kind of a watercolor painting because your pen ink will run. So just go like you’re working on coloring pages! In order to get a distinctly watercolor effect, go over some areas 2-3 times to get that lovely color variations that come with watercolors. And if you don’t dig painting, you can use any medium you prefer. Colored pencils, crayons, pastels… the world is your oyster! If you mess up don’t be too worried. Here I got orange paint waaay outside of the lines on the bottom flower. When you look closely you notice it but from a distance you really can’t. To finish I used a ruler to mark a quarter of an inch all the way around each painting. Then I used my paper cutter and chopped off the excess paper. Then I used a glue stick and mounted it to some scrapbooking paper I trimmed down to fit my frames. And voila – my art was born. Now I consider myself a crafter NOT an artist. Russell considers himself an artist and he LOVES these. I worried he’d tease me about them but he thinks they’re absolutely perfect to adorn the walls. Yay! But wait! Don’t go! I did this project/sketch pen tutorial as a part of the Silhouette Challenge. Our theme this month? Flowers! 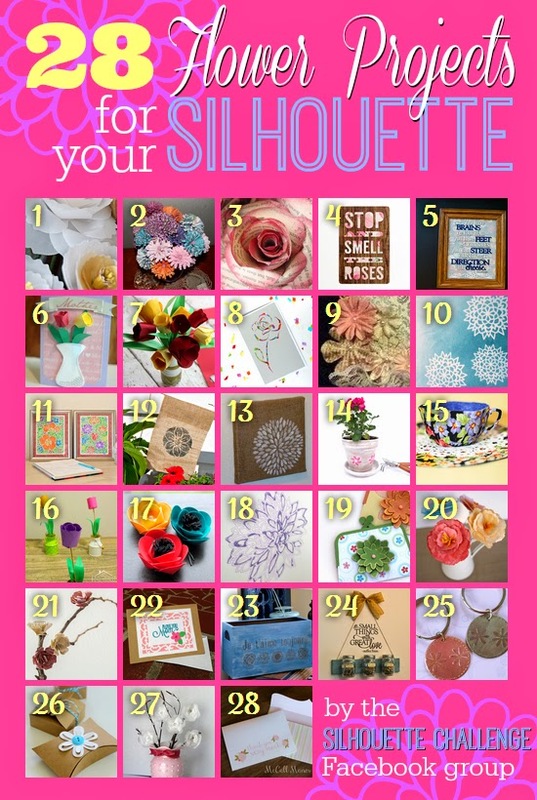 Check out what some amazing bloggers did with this month’s theme and their Silhouette machines! 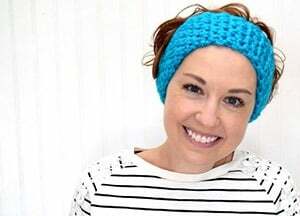 I absolutely love this idea and I gotta try it! I’m going to download that font right now. Pinning! I adore this font!!!! Thanks for the inspiration! I’m so going to use this ASAP. Love the water colors, too!! I chuckled at that part, too! We can always count on Allison to keep it real…and to keep us inspired. Such a genius use of sketch pens here…and dingbats! Goodness, how I love those dingbats. Your watercolor pictures are lovely! 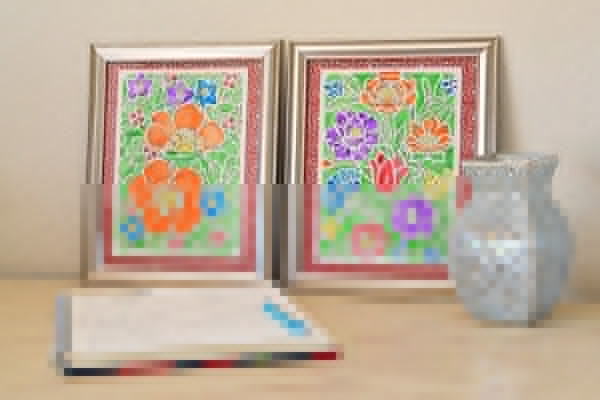 I agree, that taking off the border is better – more free flowing, like the watercolors. And you’ve given me an idea for the summertime. I’m going to make some of these for my kiddos to paint when it’s a yucky day outside. Thanks for the idea! These are genius. Seriously. Love them!! This was absolutely incredible! You did such an amazing job both with the idea and the execution! Bravo!! !